Join yoga teacher, meditation coach, reiki practitioner and self-proclaimed crystal enthusiast, Kate Van Horn in southern Baja! We'll kayak the seas, workout beachside, hike the cliffs, surf, swim with sea lions, eat local fruits, and toast under the stars – some of the most magnificent adventures Baja has to offer! I’m Kate. Yoga instructor, blogger, multi-passionate entrepreneur. But that’s just my resume. It’s part of me, but it’s not who I am. Chances are we’re a bit alike, you and me. Women just doing our best. Putting our best foot forward every day - expressing gratitude, discovering our voices, and learning how to stand in our own power. You know, trying to do ‘all the things’. I’m also a crystal collecting, donut for dessert, beagle loving, chlorophyll in my water wellness-lover driven by an intense desire to cut through the BS and help women reclaim their strength and inner light. I’m here to share with you that that you are capable, your body is beautiful, your intuition is powerful, life is a work in practice, and that you too can discover and practice radical self-love. Upon arrival in San Jose del Cabo (SJD), we'll meet you and transfer 90 minutes to the lovely Los Colibris Casitas, located on a hill overlooking the ocean in the artists colony of Todos Santos. We'll have a welcome gourmet taco welcome dinner. Optional workout on the yoga deck. Overnight at Los Colibris Casitas. Los Colibris Casitas was made for nature lovers seeking beauty and tranquility. We offer the services and amenities of a boutique hotel, combined with the privacy and comfort of a vacation rental. Each of our casas and casitas has magnificent views of the Pacific ocean, a freshwater estuary and a palm grove oasis to the front, and the Sierra de la Laguna mountains to the side and back. Todos Santos ~ About 50 miles north of Cabo on the Pacific side of the Baja peninsula is a pueblo magico called Todos Santos – All Saints. And truly, the handiwork of all the saints seems to be reflected everywhere. It’s easy to imagine that St. Anthony (San Antonio), the Patron Saint of the Desert, had his hand in the underground springs that make the town a true desert oasis, thick with palms, lush with lagoons and filled with the birds they attract. St. Francis (San Francisco), Patron Saint of the Environment, seems like a sure bet for the town’s seemingly endless miles of pristine beach – home to 5 of the world’s 7 turtle species, host to surf breaks that make the town one of the best surfing destinations on the Cape, and favored spot for gray whales on their annual trip to Baja to come close to shore and check out the humans. St. Isidore (San Isidro), Patron Saint of Agriculture, almost certainly got in on the act with the vast orchards of mango trees and fields filled with strawberries, chilies and herbs, while St. Peter (San Pedro), Patron Saint of Fishermen, could easily be the wily soul who ensured no natural harbor in the town to keep the waters from being overfished and therefore full of bounty for the intrepid local fishermen, masters of the surf launch and landing. After a delicious Mexican breakfast we'll head to Los Cerritos, one of the best surf breaks in Baja. With a smooth sandy bottom and a range of waves for surfers of all levels, Los Cerritos is the perfect place to learn to ride the waves. Our incredible instructors guarantee that you'll stand up on the board during the first hour of instruction - at least for a few moments! We'll have lunch at a terrific local joint, then we'll have the afternoon to explore the charms of Todos Santos. Our guides will conduct an optional hour-long historical town tour, with plenty of time for shopping and exploring afterwards. In the evening we'll have a cooking class with chef Iker Algorri, author of Cooking Adventures in Baja California Sur. First, we'll learn to make the perfect margarita. Second, you have to pay attention because you have to eat what you make! After a wonderful Mexican breakfast we'll transfer to La Paz where we will board our boat to Camp Cecil, a luxury tent camp on the incomparable Isla Espiritu Santo. We'll settle into our tents then let the adventures unfold. Kayaking, stand up paddle boarding, snorkeling, birding - these are just a few of the activities that await as we explore the island and the surrounding Sea of Cortez. Lunch on the island will be followed by a group bootcamp or yoga session. Dinner and overnight at Camp Cecil. tailed cat, the babisuri. It’s a remarkable place to explore. Coffee, tea and cold breakfast of granola and fruit is available for early risers. Option for an early morning bootcamp before a full, hot breakfast for everyone after that. 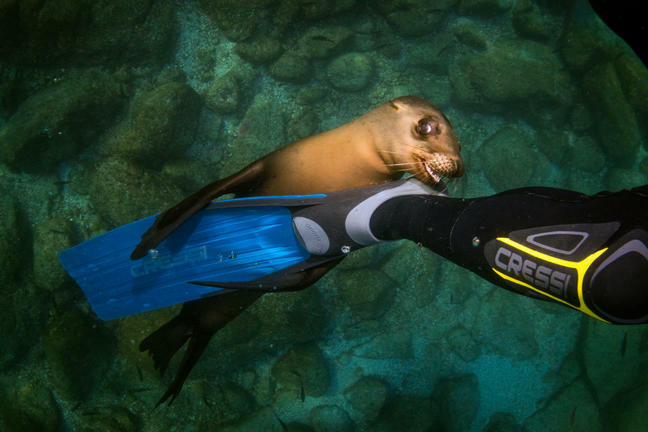 We'll then head out for what truly must be one of life's greatest joys, swimming with the sea lion puppies at the permanent sea lion colony of Los Islotes. It is an absolute blast! Afterwards visit another part of the island for a beautiful hike to get spectacular views and learn more about the flora and fauna of the island. We'll have lunch in camp, an afternoon workout gathering, then a wonderful dinner, yoga/stretching and star gazing. Perfection. After an early breakfast, depart Camp Cecil for our return to shore and transfer to the airport in San Jose del Cabo. Say adios but not good-bye as we return home or opt to extend your stay. Los Colibris Casitas was made for nature lovers seeking beauty and tranquility. They offer the services and amenities of a boutique hotel, combined with the privacy and comfort of a vacation rental. Each of the casas and casitas has magnificent views of the Pacific ocean, a freshwater estuary and a palm grove oasis to the front, and the Sierra de la Laguna mountains to the side and back. From your casa you can watch the fishermen cast their nets on the beach in the early morning light, wait for the green flash of a magnificent Baja sunset in the late afternoon, and enjoy the vast expanse of a star-filled sky at night. Los Colibris is just a 10-minute walk to 70 miles of pristine, virtually empty beach, and a 5-minute drive to the delightful restaurants, artists’ galleries and shops of Todos Santos. Camp Cecil is located on the pristine and wildly beautiful Isla Espiritu Santo, part of a National Marine Park and UNESCO World Heritage Site. The camp includes 8 walk-in tents that have real beds, lovely linens, chairs inside and out, bedside tables with lamps, mirrors, storage areas and towels for beach and bath. Each tent can have either one king bed or two twin beds, and there is room for cots as well. The housekeeping staff cleans the tents and makes the beds each day! There is a large dining tent with tables, chairs and lounging sofas where the camp chefs serve terrific food throughout the day, starting with cold breakfast and coffee, followed by hot breakfast, lunch, happy hour and dinner. Two sun showers and two compost toilet cabañas complete the camp. Meals at Camp Cecil’s Espiritu Xantu Café, considered one of the best restaurants in the vicinity of La Paz! NEED MORE INFORMATION? CONTACT US AT 720.206.3792 or INFO@ROOTADVENTURES.COM. OR COMPLETE THE FORM BELOW and we’ll reach out to you!